Spirent Communications plc (LSE: SPT), the leading provider of navigation, positioning and wireless test solutions, recently announced a new product to address functional testing of wireless devices on manufacturing lines and in service/repair centers. The Spirent GSS5300 has been developed for rapid simultaneous functional testing of up to 2 wireless-enabled devices with multiple RF interfaces, including Wi-Fi, Bluetooth, FM and NFC. Spirent’s GSS5300 also operates with widely-used Spirent GNSS constellation simulators to test GPS, GLONASS, Galileo, and QZSS technology. 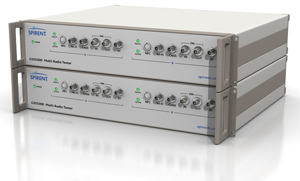 Spirent’s GSS5300 multi-radio platform can be used with Spirent’s new GSS6300M multi-GNSS simulator, which enables testing of fundamental GNSS receiver functionality including time to first fix, sensitivity and accuracy on the manufacturing line.